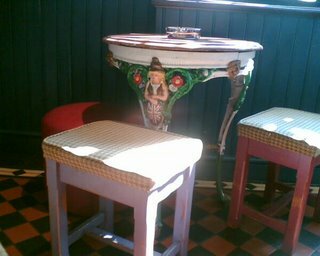 And the siting of the bar very close to the window seats means that it's difficult to get from one side of the room to the other, even when it's quiet like it was on Good Friday. But these are minor quibbles, and in an area where there's not much else on offer, (and just 25 minutes from Tooting Bec on the 249!) this is a welcome addition. Now they're just waiting for a Sainsbury's! OK, so it was probably trendy a few years back, and is now the home of yummy mummies with triple Land Rover buggies. But Al and I went there anyway. 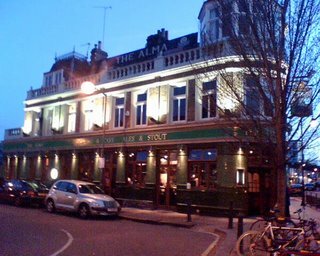 I had been to visit a radio station in Twickenham (yes, it does have one, though it's probably not what you're expecting) and Al was travelling from his workplace xxxxxx in Victoria, so The Falcon, next to Clapham Junction railway station (not in Clapham, fact fans) was a convenient starting place. This is an odd one. 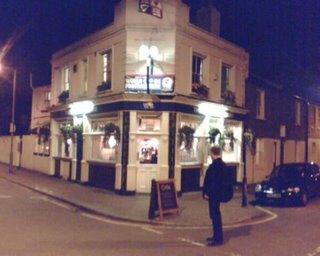 It's a nice, big, old pub. A giant island bar, reckoned to be the biggest in London/The UK/The World (delete depending on how many pints you've had) and several distinct bar areas, some still actually separated by screens, including a no-smoking area for food during the day. But it does get very smokey, and has more than its fair share of mad old men than you'd expect for a comparatively upmarket area. Add in some commuters having a secret swifty before going home to the wife, and you have what could be charitably described as a "mixed clientele". So Al and I decided to take the train one stop on to a pub I'd wanted to try for some time - The Alma, next to Wandsworth Town station. 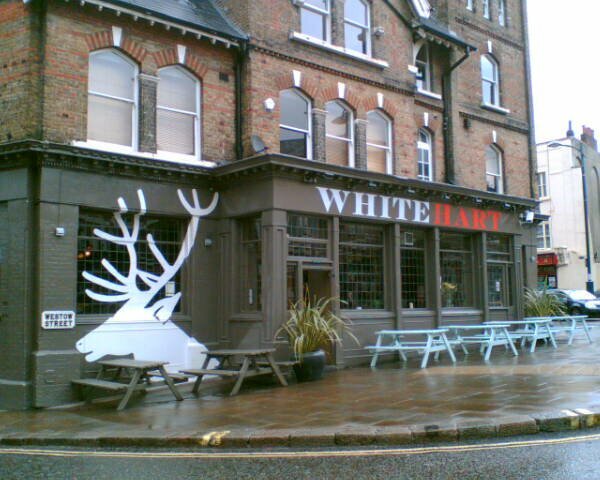 I'd heard different opinions of this place - it was one of the first boozers to have a yuppie make-over, and is a GPG main entry - but had also seen reviews that said it was now over-run with suits, rugby-shirts with upturned collars, and all that that entails. 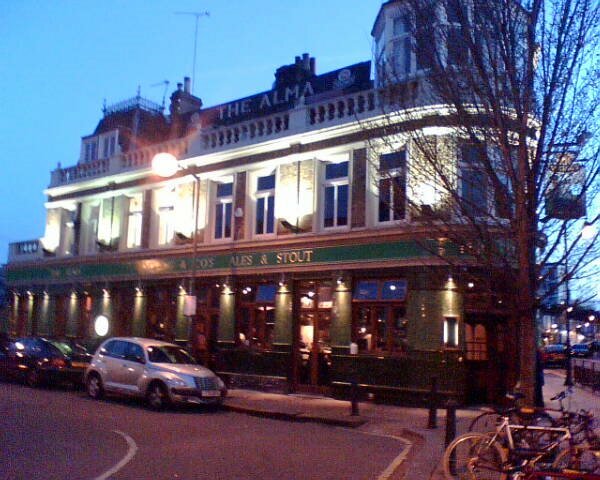 The good news is that when we were there - admittedly a Monday night - it was reasonably quiet, we got stools at the bar, and enjoyed a good pint in civilised surroundings. Our only comment was that there was something missing from the centre of the room - as there was a big square bar in the middle, but nothing else to give a large room any focus. Perhaps when the rugby is on, everyone needs a view of the telly! Overall, very good, but not great. If you're in Wandsworth, it's a good bet, and I wouldn't mind this as my local, but I wouldn't say it's worth going out of your way for. 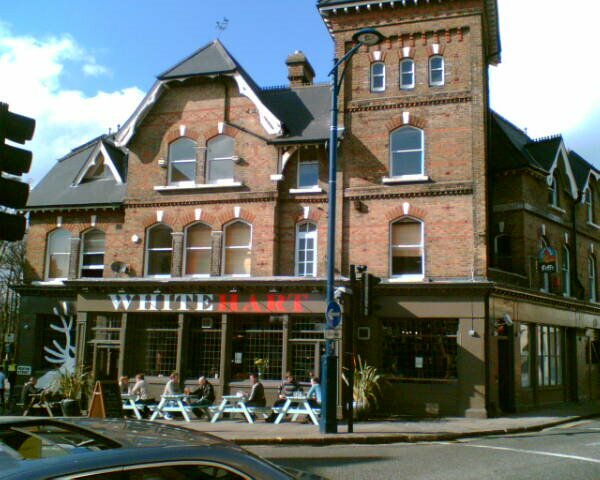 We found a second boozer - The Royal Standard (Ballantine Street, SW18) - next door, that perhaps looked better from the outside than it did once inside. 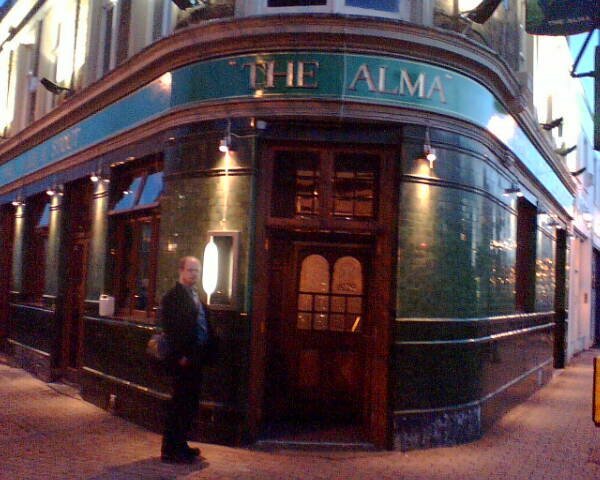 A perfectly good little local in complete contrast to the Alma, with Aussie beers, a dartboard and a telly showing the match. It showed evidence of once having been a Tup (I think), but it now needed a bit of love and attention, and money spending on it. Although commendably, they had takeaway delivery menus on display, and let you order food in, even providing condiments etc. An excellent idea that more pubs without their own kitchen should adopt! A fine English traditional wrist-slitting hole. 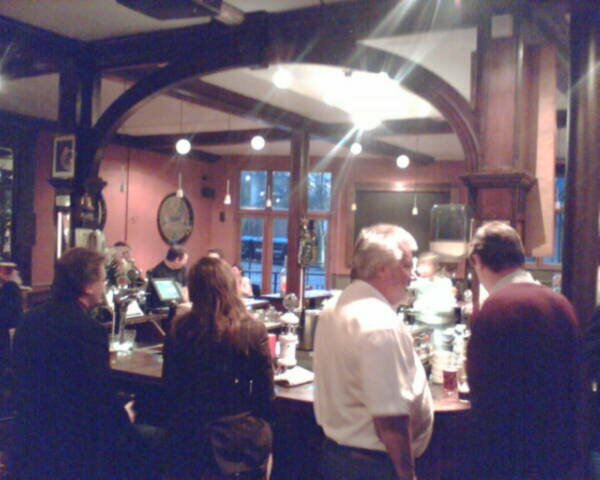 The Pelican is a standard Fosters pub with a loud line in musak (Tina Turner's Simply the Best, Bon Jovi's Keep the Faith), a silent telly showing the football and a conservatory out the back, for "dining". It's slap bang in the middle of the most inappropriate and seriously ugly (even taking into account the milieu's depressing standards) industrial estate evah, on the banks of the Wey Navigation halfway between Weybridge and Addlestone. The Pelican, yesterday. Canal to the right - frighteningly horrible industrial estate to the left. The pub will always make money because of its location (it gets weekday lunch trade because of the estate, weekend lunch trade because of its proximity to the water and it's the only pub for miles around), so it doesn't have to try. "We tried to order food in this establishment at 8:30 last night and were told that the kitchen had already closed (despite a statement on the menu that food is served from 3pm until 9pm). However, the bar did wait until we had purchased our drinks before telling us this." With a pitiful selection of bitters and offers of a Sunday roast from £5.25 (mmm! that's going to taste nice! ), the whole place smacked of rank amateurism and provincial pointlessness. I liked it. 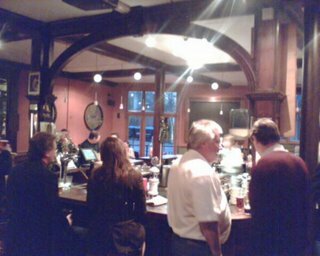 It felt like a proper boozer, dark without being poky, smoky without being too choking, busy without being full and both comforting and threatening at exactly the same time. The pub garden holds a good 20 picnic tables which I imagine are packed during the summer as the lawn goes right up to the canal edge, and it seems exactly like the sort of place to wile away a few hours with a couple of good friends who are more interested in the company than the environment. Being near a towpath, it's on a good walk network too. And despite the money they must bring in from the food, it's still secondary to the boozing space. 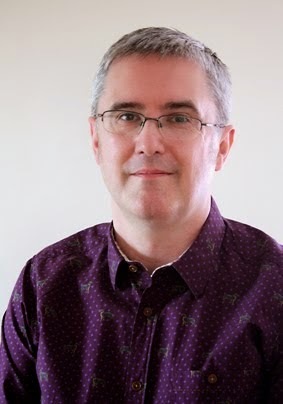 If the place smartened itself up (which would require someone with a bit of vision, and anyone with any vision is going to be put off by the industrial estate), the pub would become packed, over-priced and annoying. 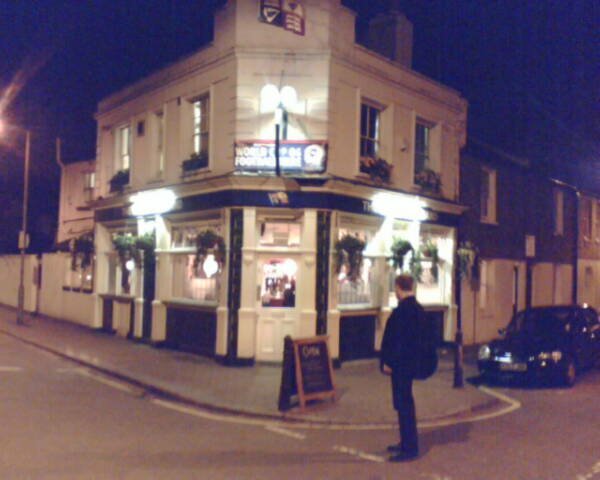 In fact, it would become like The Minnow, in Weybridge. 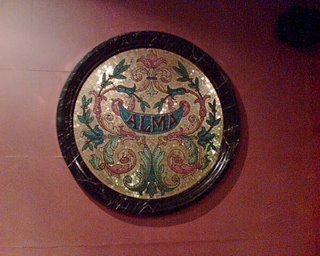 This, again, is not a bad place, we had a very nice meal there, and they do a decent pint of Timothy Taylor (Madonna's favourite tipple, Fact Fans) but it's been refurbished in a kind of Essex money way, and any soul it had has been forcibly removed. Unfortunately everything about this pub gives off an aura of being exceptionally pleased with itself. This attitude is all-too-common in the home counties and tends to filter down from the owners, usually a smug, 4x4-driving couple whose naked desire to screw as much money from their customers as possible contaminates everything they're involved with. When a pub makes such a self-satisfied song and dance about what it does (rather than quietly gets on with it), your expectations increase commensurately, so when one member of our party failed to get his meal before we'd virtually finished ours (on a fairly quiet Monday lunchtime), we were more than a little pissed off. No apology, of course. PS Those "stylish" black and white photos on the website of the young, trendy staff sharing a private joke about your dress sense whilst you're waiting for some service can also be found on poster-sized sandwich boards outside the pub.